Booking a Cool Kids school prom disco is easy, simply email us at: dj@SoundONE.co.uk or use the Contact Form to send us an email. 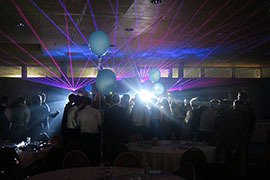 We provide some of the coolest school prom discos in Cornwall. Your school prom is a very special event, so we want to make it as special as possible. Unlike most other discos, we have all the latest pop and chart music, as well as all the latest pop and chart music videos. We can provide a large lighting display, all singing and dancing, or something more subtle and elegant depending on the type of prom you want. Not only will you want a Cool Kids high quality disco, you may also want some other entertainment at your prom, such as a school band or a semi-professional / professional band that is hired in. This isn't a problem for us as we have worked alongside dozens of bands and other entertainers. We will quite happily work in conjunction with your chosen band or other entertainment to ensure you have the best prom experience ever. You're welcome to provide a playlist to give us an indication of the type of music you would like. We understand that not all proms are the same and young adults' tastes in music can be quite diverse.